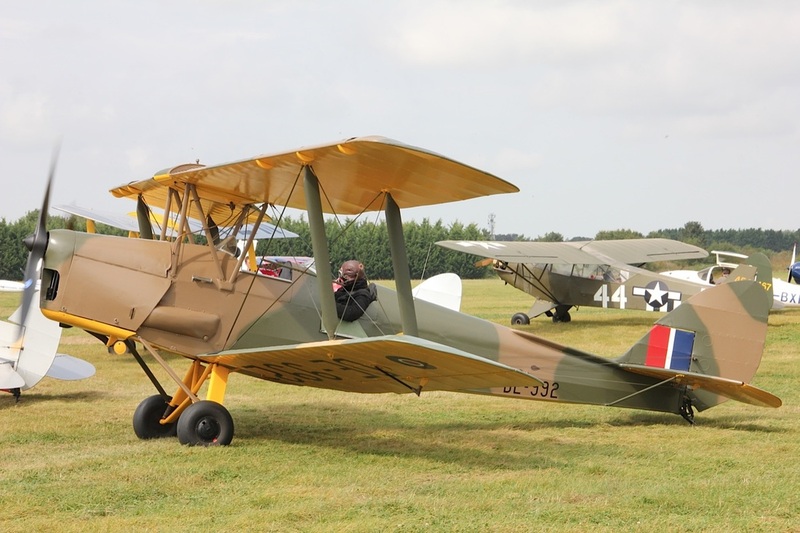 Our Tiger Moth wears authentic RAF camouflage livery and serial number DE 992. In 1943 the de Havilland factory in Hatfield was fully committed to the production of Mosquitos. As a result, the vast majority of Tiger Moths completed during World War 2, including DE 992, were built under licence by Morris Motors at Cowley. In 1952 she was released for civil use and registered F-BGJI, flying with the Aero Club de Calais until 1968 and the Aero Club de Provence at Fayence until 1970 when she returned to England. Her first home was in Norwich, where she was given her current registration G-AXXV. From Norwich she moved to RAF Linton-on-Ouse in 1971, and finally went into semi-retirement at Gransden in 1976. She passed through the hands of a number of owners between 1976 until 1991 when she was restored to he current configuration in 1991. She was operated by new owners between 1992 and 2013. Having retired from his long RAF and airline career, Robin Russell decided that more people should be given the opportunity not only to fly in a Tiger Moth, but also to learn to fly the aeroplane and experience the unique sensation of flying it solo. He bought G-AXXV in May 2013 and embarked on a flight instructor course to enable him to achieve this ambition. It was at this time that Bob Gibson was looking for a Tiger Moth to continue the fights he offered through West London Aero Club at White Waltham. The aeroplane that he had been using had been retired from flying training duties and it seemed that Tiger Moth training would have to cease at White Waltham. Bob heard about Robin and his aeroplane and, as a result, we’re very pleased to continue to provide Tiger Moth training at White Waltham. This year, we’re looking forward to celebrating the 80th anniversary of the establishment of The de Havilland School of Flying at White Waltham in 1935.